Plumbing systems on your narrow boat are relatively simple compared to those commonly found at home. There are no solid walls to drill through, no floor carpets to remove before ripping up floor boards and no soldering of awkward joints in awkward positions in a filthy loft or underfloor space. There are however, some unique considerations to bear in mind when planning your plumbing system. When planning your narrow boat pipework, it is sensible to ensure that all pipes are accessible for future maintenance and inspection and therefore it is not recommended to install runs under permanent flooring or in the bilges. 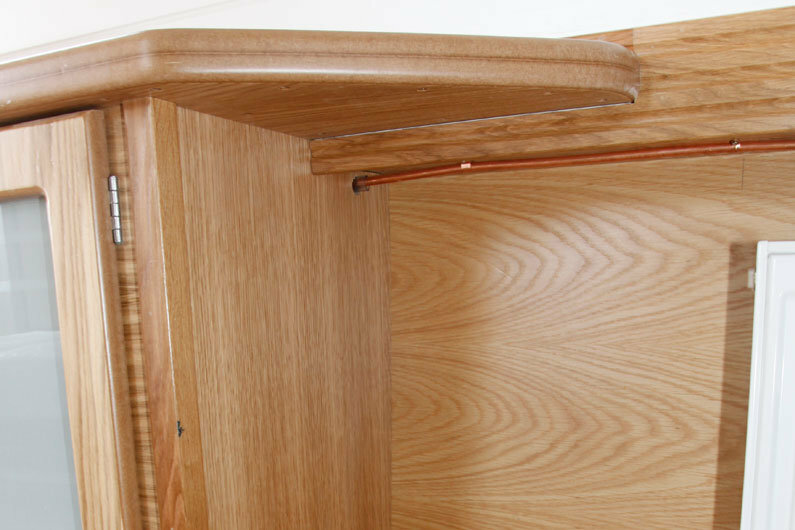 Pipes are usually clipped above floor level and run behind boxed furniture or hidden by low level removable plinths. Be mindful of access to any joints or service valves, especially if you are planning to fit a dinette, wardrobes or a bed etc. against a wall panel that pipes are clipped to. A bit of time taken in the planning could save a whole deal of grief in the future. The common choices for narrowboat pipework material is either copper or polyethylene plastic or a combination of both. Plastic (Polyethylene) or copper? Another emotive topic of heated discussion amongst boat owners and builders. The fact of the matter is that you should use whatever you are comfortable with. We will say that for ease of fitting, plastic has become the primary choice for most installations, certainly for potable water. The benefits of push-fit fittings and easy to handle plastic pipe lengths are obvious for the DIY fitter. So long as you buy a good quality system, follow the manufacturers instructions regarding measuring and cutting and use strengthening inserts at joints there should be no reason why a person with basic skills shouldn’t attempt plumbing. Note that there are a choice of push-fit fittings available so go for the best you can afford. Those that push then twist offer extra security. With regards to copper, some may feel that there may be a risk of soldered joints failing from vibration but this is rare on well engineered systems. The most obvious potential difficulty is the skill of soldering in the first place! Another area of concern may be the freezing and splitting of copper pipework in winter versus a perceived resistance of plastic. It’s true that plastic pipework will handle expansion and contraction better than copper due to the elasticity of plastic but it is still recommended to insulate plastic pipework if there is a risk of freezing. Insulation is readily available from most DIY stores and comes in the form of split foam lengths which can easily be slipped over pre-installed pipes. Allow room for fitting insulation when planning the system installation. As winter approaches it makes sense to winterise the narrowboat system by draining down if you do not live aboard. A plus for copper is that it has a higher thermal diffusivity and will therefore provide higher heat through radiation. Low level plinths can have ventilation slots cut to allow heat radiation but the benefits of this in reality are questionable. The plus for plastic on this point is that it is safer to handle when hot. Your choice. Push-fit fittings for plastic pipes can be used to join plastic pipes to copper pipes. These push-fit fittings should not be used with stainless steel or chrome pipes. It is difficult for the teeth in the fitting to bite into the hard surface of these materials and you then have a risk of the fitting blowing off in the future. Good quality push-fit pipe systems can be used for central heating installations. Check with the manufacturer of the pipework as to what fittings are recommended for specific heating applications. For example, not all push-fit service valves are suitable for use in a heating system. Also, it is not good practice to use plastic pipes for coupling directly to a boiler or heat source. The recommendation is to use at least 1m of copper pipe out from the boiler and couple your runs of plastic pipe directly to this. For those not confident with soldering, metal compression fittings can be used within the copper run where necessary. Compression fittings clamp a small ring of copper called an olive around the pipe which forms a seal within the fitting as it is tightened. Ensure the copper is cut with a pipe slice & not a hacksaw as any rough & uneven edges will compromise the joint by potentially fouling the olive and allowing water to leak past. Push-fit fittings and plastic pipes can be used to connect flow and return pipework to radiators. Again, use the correct radiator valves and use pipe strengthening inserts as recommended by the pipe manufacturer. Protect narrow boat pipework that penetrates walls and bulkheads by using grommets or at least ensure adequate clearance of holes to avoid chaffing during expansion and contraction. Waste grey water on your narrowboat from washing-up and bathing goes down the plug and straight into the canal. Showers and baths will usually have assistance from a pump as they sit lower than the waterline and the waste water has to be lifted to be evacuated. Kitchen sinks and bathroom vanity basins tend to be above the level of the canal water so therefore we can let gravity waste the water to the outside. Standard domestic water traps can be used under plug holes on sinks and basins but are not absolutely necessary. They are useful for the retrieval of rings or earings that may be inadvetantly dropped down the plug hole however! In any case the standard type of pipe used for waste water is clear PVC hose reinforced by polyester yarn. Widely available from most chandlers, it comes in varying diameters to suit most plumbing connections and through-hull skin fittings or drain outlets. When planning the position of sinks relative to external drainage fittings it is important to ensure a downward flow from sink to fitting and to try and keep the run of hose as straight as possible. Attach the hose to the through-hull drain fitting and sink outlet with good quality stainless steel hose clips. It’s good practise, although not absolutely necessary on inland boats, to use two hose clamps at each end of the hose for extra security. Include periodic checks of all hose connections as part of your maintenance plan. Regular expansion and contraction of plastic hoses can loosen clips over time causing hard to detect leaks into hard to access bilges. Incidentally the Boat Safety Scheme requires that through hull outlets are at least 10 inches above the waterline.